Listen to "Dark Agenda: The War to Destroy Christian America" on your iOS and Android device. 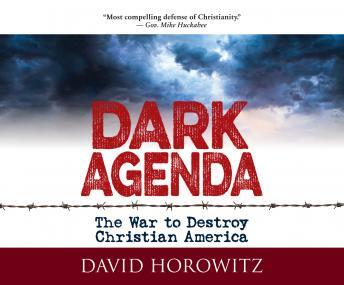 New York Times bestselling author David Horowitz exposes not only the progressive war against Christianity but also a war against America and its founding principles-which are Christian in their origin. Dark Agenda is about an embattled religion, but, most of all, it is about our imperiled nation. Tackling a broad range of issues from prayer in the schools to the globalist mindset, Horowitz traces the anti-Christian movement to its roots in communism. When the communist empire fell, progressives did not want to give up their utopian anti-God illusions, so instead they merely changed the name of their dream. Instead of "communism," progressives have re-branded their movement as "social justice." Dark Agenda shows how progressives are prepared to use any means necessary to stifle their opponents who support the concepts of religious liberty that America was founded on and how the battle to destroy Christianity is really the battle to destroy America.